The 4th and Final season of popular comedy series Catastrophe will premiere on ABC this week. 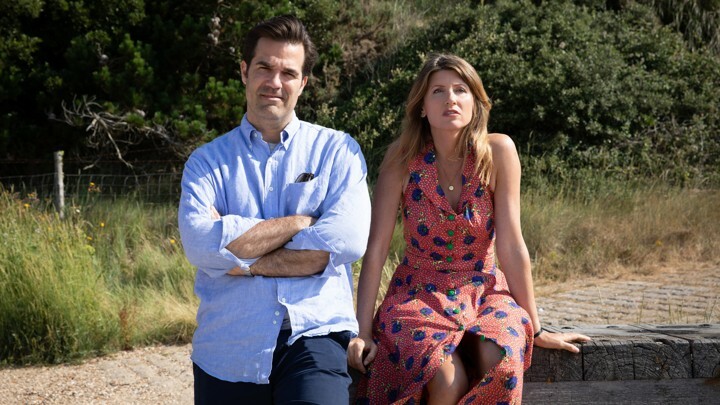 Rob Delaney and Sharon Horgan write and star in Catastrophe, a comedy following an Irish woman and an American man who make a bloody mess as they struggle to fall in love in London. We re-join the couple after Rob’s (Rob Delaney) secret relapse to alcoholism ended in a dramatic car crash and forced confession to Sharon (Sharon Horgan), while Chris (Mark Bonnar) displayed an unexpected softer side towards Rob and an altogether less soft side to Fran’s (Ashley Jensen) obnoxious new boyfriend. Now, as Rob tries to head on the straight and narrow and Sharon does her best to support, “it’s like he’s on a crusade, but to somewhere boring and we all have to come”, will the couple navigate the relentless tsunami of life’s challenges, or see their relationship finally submerged by it all? With Rob potentially not the only one on the wrong side of the law, health issues, new religious dalliances, a “briefcase of vegetables” and ever-infuriating family members to contend with, what could possibly go wrong? In this first episode Rob embraces sobriety and tries to atone for his car crash, while Sharon finds her own way of dealing with the fallout. Catastrophe (season 4) - Thursday 18th April at 9:45pm on ABC.